What Will President Trump and a Republican Congress Mean for Consumer Rights? 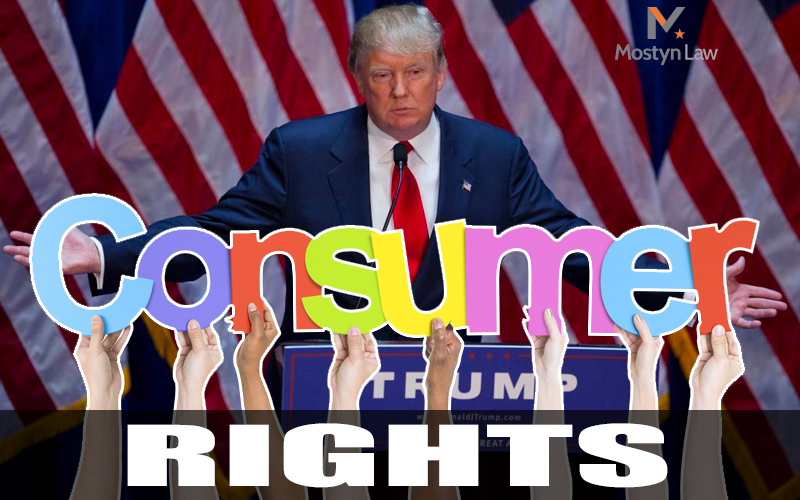 With Donald Trump soon to take office as our next president and Congress remaining under Republican control, it’s safe to say that the future of consumer rights is in flux. Republicans have traditionally defended the rights of corporations over the rights of consumers, and many legal observers believe consumers will have a tougher road ahead when Trump, himself a billionaire and mogul, is in the White House. For instance, Ira Rheingold, Executive Director of the National Association of Consumer Advocates, said forced arbitration is at the forefront of consumer rights issues and is subject to change in the coming months. Forced arbitration clauses state that customers must go into private arbitration instead of suing a company in court, thereby preventing consumers from filing class-action lawsuits. Arbitration tends to favor companies over consumers. Republicans have already tried this year to give companies the freedom to insist on arbitration instead of court. In June, Rep. Marlin Stutzman, R-Indiana, floated a bill to revoke the authority of the Consumer Finance Protection Bureau (CFPB) to restrict forced arbitration. “My legislation would allow consumers and companies to choose how they want to deal with their legal matters, preserving the option to pursue arbitration agreements which is a faster, more efficient and less costly alternative to class-action lawsuits,” Stutzman said at the time. That reasoning is flawed, however. The fact is that the cost of private arbitration can be prohibitive for consumers. And far from “preserving” an option, forced arbitration actually removes the option of a class-action lawsuit—just as the name implies. Stutzman wasn’t the only Republican working overtime this year to prevent consumers from suing companies that wronged them . Rep. Jeb Hensarling, R-Texas, introduced a bill in September that aimed to “repeal [the] authority to restrict arbitration” from both the CFPB and the Securities and Exchange Commission (SEC). The timing of the bill was no accident. Rheingold noted that the CFPB is gearing up to release new rules on the use of forced arbitration clauses by financial services companies. It’s always possible that a court could strike down the CFPB rules. Rheingold also noted that Congress—which, remember, will be controlled by Republicans—would also have the ability to strike down the rules. “I assume there will be a fight, and a pretty big fight, on whether or not the CFPB’s final rulemaking on arbitration will become law,” Rheingold said. The importance of new rules that govern how customers of financial services companies can settle disputes is not merely a theoretical concern. In September 2016, the CFPB ordered Wells Fargo to pay $190 million in settlements and remediation for opening millions of fake accounts. Yet, the bank’s customers have found themselves unable to sue due to arbitration clauses. When news broke that Wells Fargo was using arbitration clauses to keep consumers from suing, Republican politicians stayed silent, while Democrats, including Sen. Elizabeth Warren, D-Mass., slammed the company for the practice. It was yet another indication about how Republicans might act when they control both the legislative and executive branches. In addition to arbitration rules, Rheingold said his organization is also keeping an eye on what will happen when the CFPB issues rules on payday lending and short-term loans that can be unsafe for consumers. He also expects that there might be bills introduced to lift mortgage restrictions that are part of the Dodd-Frank Act, as well as changes to Fair Housing Act loans. Yet, as we head into 2017, it’s too soon to tell what the future holds. Trump’s stance on consumer protection is still unclear, and Rheingold has not thrown in the towel. © 2019 Mostyn Law. All Rights Reserved.